In addition to litigating a large number of fire cases as listed above, we have been retained to conduct and supervise a significant number of fire scene investigations and to coordinate the retention of experts for the forensic analysis of cause and origin of fires. The experts with whom we frequently work are skilled in detecting causes of fires, including fires caused by electrical sources and accelerants. We work with cause and origin experts, electrical experts (including electricians and electrical engineers), thermodynamics experts, fire department investigators, police and chemists, and we are well versed in each of these areas, which allows us to communicate more effectively with these specialists about the scientific issues associated with fire litigation. In litigating fires we have designed experimental laboratory techniques to actively test theories, including the construction of full-size model dwellings to measure fire behavior, the simulation of electrical overloads in components and flame testing materials with careful thermal sensor measurements to determine flash point potential. Our laboratory evidence is developed with our experts and has been of invaluable use to courts and juries, as well as insurance claims professionals in the evaluation of settlement. Our trial experience includes declaratory judgment and bad faith actions relating to fire insurance, including coverage disputes for large commercial buildings relating to insurance primacy and lapses in coverage, as well as exclusions and denials related to intentionally set fires. 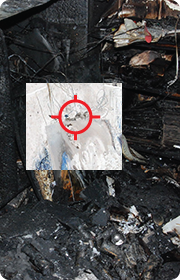 We have litigated arson issues within these disputes, and are familiar with the issue of “steered investigations” allegedly leading to criminal prosecutions against claimants for arson and the bad faith claims that arise from these assertions. We are also experienced with the insurance coverage disputes that can arise between primary insurers and excess/umbrella level carriers in relation to the issue of whether the primary insurer has a duty to settle that runs to upper-layer insurers. The two most common kinds of explosions we have handled are those that arise from the rupture of pressurized vessels (which can occur as a result of control system and valve failures, metallurgical defects and other causes), and the ignition or sparking of highly volatile combustible substances, such as rocket fuel, petrochemicals and particulates. We have handled explosions in each of these areas, which has given us a deep understanding of the basic science and processes involved in understanding the root cause and human elements that lead to apportionment of liability or fault in the aftermath of these often catastrophic losses. The firm’s excellent knowledge base in chemical engineering provides invaluable benefit in this area of the law. 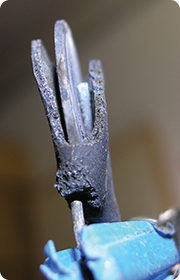 A metal-oxide varistor (MOV) from a power strip that allegedly caused a fire in a private residence. We were able to prove that the true cause was a defectively installed light fixture. Defending a claim against a phone manufacturer, we determined that a ball of duct tape blocked the cooling vent of a computer, causing a massive fire that destroyed a car dealership. This discovery prevented a costly lawsuit .